On June 2018 something has changed in the Israeli Handball – The federation hired the former Portuguese national head coach – Rolando Freitas as the youth national teams coordinator. 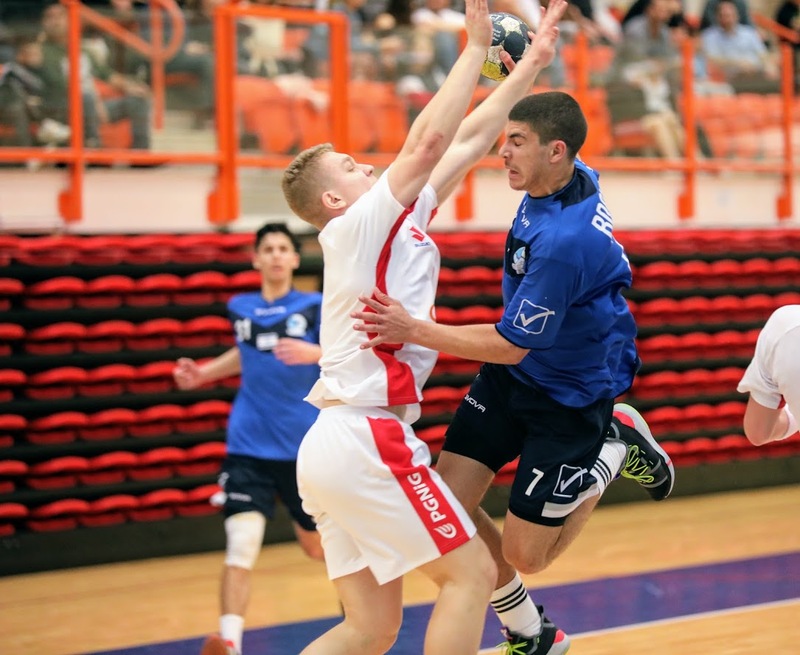 From that time, the Israeli M18 and the M20 succeed to stay in the European top level after the Euro’s championships, but Freitas have higher ambitions. This is the reason that he decided to put one of the best Israeli coaches, Dvir Goldstein, as the M18 head coach and Nissim Falach, H.C Holon head coach, as his assistant. They started to work for 2020 M18 Euro already and want to finish in a better place than the 2018 one. Because of that, they host a friendly match with Poland as a test for the work that they did with the players so far. Goldstein’s players started the match very well and The Polish head coach, Jakub Bonisławski, took his first time out in the 7th minute after 4:1 goal by Or Maman from H.C Holon. Good minutes by Victor Pacula from MKS Zaglebie Lubin led Poland back to 5:5 in the 11th minute. Without any timeout, Israel took the control back with the help of SGS Ramat Hasharon goalkeeper, Daniel Peleg. In the attacking side, Or Levy from Holon with 6/6 goals made it 16:10 for Israel (25th minute) and another save by Peleg sent the teams for the half time break with 18:13. The second half was not a dramatic one but Hundreds of Israeli Handball fans in Hadar Yosef hall in Tel Aviv had a pleasure to watch high level Israeli team and the Middle Back from Ironi Rehovot Nadav Cohen in particular. Cohen did whatever he wanted on the floor and scored from each of every spot, even coach to coast one. The biggest gap was in the 45th minute by Tom Leyvov from ASA Tel Aviv, 25:16. Afterwards, SMS Gdansk player David Reichel help his team to reduce the score for 25:19 in the 48th minute but the better team on Friday was Israel that took the control again and won 34:27. Israel: Or Levy – 8/11, Nadav Cohen 7/8, Itay Shalma – 3/4, Roei Livgot – 3/5, Or Maman and Tom Leyvov – 2/3 each, Barak Karmon, Tom Rosenfeld, Ziv Golan and Omer Mordov – 1/1 each, Alon Shulman and Yonatan Hadar 1/2 each, Aviv Sharabi – 1/4. Goalkeepers: Daniel Peleg – 9/21 – 42.8%, Yotam Buchnik – 4/19 – 21%. Poland: Victor Pacula – 8/9, David Reichel – 5/10, Marcin Głuszczenko – 3/5, Patrick Iskra and Robert Targonski – 2/2 each, Filip Węgielewski and Mitosz Baczek – 2/3 each, Jakub Koztowski and Damian Domagala – 1/1 each, Grarcjana Wrobel – 1/2. Goalkeepers: Jakub Ataj – 4/16 – 25%, David Wodzinski – 11/33 – 33.3%.